It's Go-ing to be an exciting match between man and machine. The game of Go traces its roots in ancient China almost 2,500 years ago. It is set as a strategy game for two players in which both try to surround as much territory on the game board as possible. Despite the game’s relatively simple rules, it is considered by many as being much more complex than chess as it provides players with a bigger board, making room for more gameplay as well a providing more ways for alternative moves. 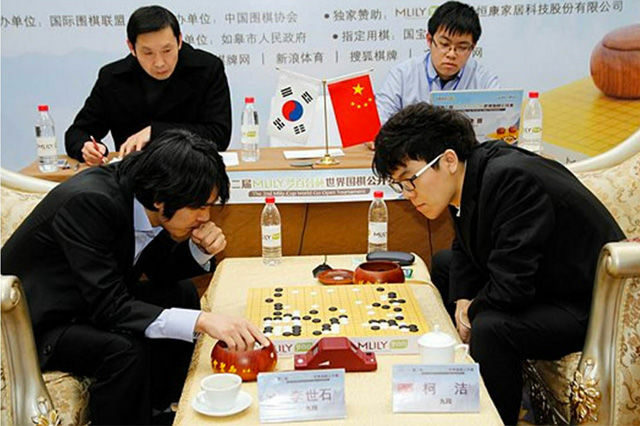 Lee Se-dol (left) vs Ke Jie at the 2016 MLily Go Tournament. Ke won the tournament by beating Lee. Go’s complexity attracts many players from across the globe to engage in competitive play, thus producing some of the best Go players the world has ever seen. From the years between 2007 to 2011, grandmaster Lee Se-dol of South Korea ranked 1st in the world of Go. But when he went against AlphaGo, a Go-playing computer program developed by Google’s DeepMind, last March, his ranking went down to 4th place as he lost to the program 4-1. In the last few years, 18-year-old Chinese child prodigy Ke Jie has held the title of world’s best Go player. After witnessing Lee’s first game of the Go match with AlphaGo, Ke did not entertain the idea of a game with the computer program, saying, “I don’t want to compete with AlphaGo because judging from its matches with Lee, AlphaGo is weaker than me. I don’t want AlphaGo to copy my style.” He even posted on his Weibo account asserting his belief that AlphaGo couldn’t beat him. But after witnessing AlphaGo win three games in a row against Lee, he changed his tone by praising the program’s strategy. “AlphaGo was perfect and made no mistake. If the conditions are the same, it is highly likely that I can lose, ” said Ke. Ke Jie may finally be able to test his Go skills against AlphaGo as Yang Jun’an, the executive member of the International Go Federation, has just announced that a match between Ke and the program may commence before the year ends. Though no further details were disclosed by the executive member, he did confirm that discussions between the two parties are “inclined to make it happen.” Yet Ke Jie might just have to get in line.